The Met Office has this morning issued further warnings ahead of what is expected to be one of the coldest spells of weather so far this year. 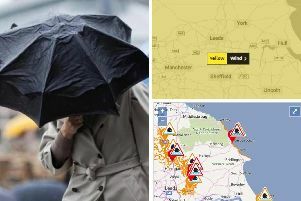 Yellow warnings have already been put in place for much of the country but they have now been extended even further across Yorkshire as forecasters warn of an icy blast heading our way. The warnings for snow and ice have been issued for much of Tuesday from 6am through to 3pm, while the far eastern corner of the county could still see some wintry showers remaining until 9am on Wednesday. A statement on the Met Office website states: "A spell of sleet and snow will continue to move southeast across the UK on Tuesday, gradually weakening across England and Wales. "Some roads and railways may be affected with longer journey times by road, bus and train services. As rain, sleet and snow clears Northern Ireland and Scotland overnight Monday, ice may form on some untreated roads, pavements and cycle paths." The Met Office chief forecaster adds: "Further showers of snow, sleet and hail will affect western parts of the UK, these frequent in western Scotland and the north of Northern Ireland, where thunder is also possible. Warnings for ice and snow have been issued for Yorkshire by the Met Office. "One to three centimetres of snow may accumulate at low levels inland, and perhaps five to ten on hills above 200m. Showers will gradually fade overnight Tuesday into Wednesday, with icy stretches developing as skies clear, particularly where earlier snow has partly melted. "As is usually the case with showers, some places will miss them, while some coastal fringes may see rain or hail." The Weather Channel expects the big chill to continue for the next few days. "The Arctic conditions will really take hold on Tuesday when snow and sleet sweep south-east across Britain," its website states. "Some significant snowfall is possible but waves of wintry showers are expected to fracture as they head south during the day with brighter weather following. The Met Office warning takes in much of Yorkshire. "A similar picture will follow for much of the week with cold, dry weather interspersed with wintry showers. Colder temperatures and more wintry showers will continue for the weekend and this will signal a spell of more wintry, changeable weather. "It will remain colder than normal, with the risk of snow as a wave of frontal systems smash into the cold air and stubbornly park across Britain throughout the weekend." A spokesperson for The Weather Channel added: “It will turn bitterly cold this week as air is dragged in from the east with high pressure dominating from Scandinavia. “There will be widespread frosts and snow around through the week leading to a risk of ice. Highs will be 2-4C below the average but it will seem like -3 to -5C in the north-easterly winds."